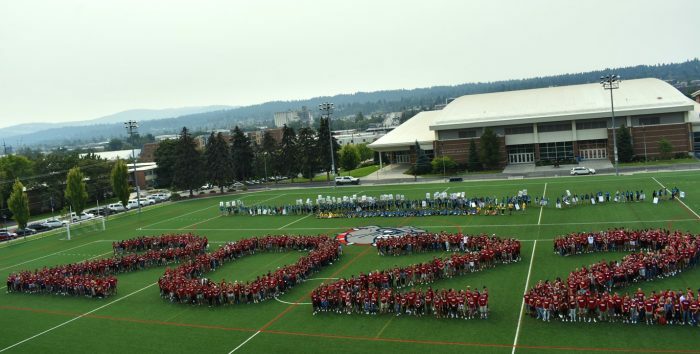 Orientation Weekend was full of excitement, as we welcomed your students into our Zag family. As new students walked through the front doors of the Hemmingson Center, they entered an energetic environment that fosters an inclusive community made of students, staff, faculty and friends of GU. Friday of Orientation Weakened brought all of you helping your students begin to acclimate themselves into the Gonzaga community. On Friday, your students were able to go to the Spokane Community and Student resource fair, sign Gonzaga’s Historic Wall, partake in Opening Ceremonies, have fun at Playfair and experience Fred Meyer night while getting great discounts! With over 150 student clubs and organizations, your student saw so many opportunities to get involved during their time at Gonzaga. Saturday started off with Small Group Meetings where students met with their Orientation Leader to get to know other first year students. After Small Group meetings, students heard from current professors, staff, and students about their experience at GU during the Mission and Transition Panel. To finish off their morning, the Class of 2022 took their class picture and then listened to a presentation from the Career and Professional Development Center. Ending the afternoon were the Zags Help Zags Sessions where students learned to be active bystanders who step in to make a positive difference in the Gonzaga community. To finish the day was Welcome Night, one of Gonzaga’s best New Student Orientation Traditions. Sunday and Monday of Orientation Weekend were a perfect gateway into the Academic Year. These days consisted of the President’s Reception, Small Group Meetings, How to Zag Rotation Series, seeing a performer in Downtown Spokane, Academic Convocation, Advisor meetings, a welcome back BBQ, and a carnival sponsored by the Gonzaga Student Body Association. So many things for New Zags! It can be scary to go off to college and start a new journey, but through these activities, students can unite and lean on each other as new friendships start to form and grow. All of us in the Office of First Year Experience programs thank you for a great Orientation Weekend experience! We hope you enjoyed yourself as much as your students did. As mother of a first kid to send to college, I could not ask for nothing better than the Parent Orientation offered by Gonzaga; I cannot more grateful for the feeling I had when said bye to our daughter … “She could not be in any better hands”. From the bottom of my heart I know this is the right and best place for her to be and I know that the Community of Gonzaga University will support her in whatever way she .may need. THANNK YOU for an excellent job with Freshmen’s parents !!!! My family enjoyed the orientation weekend dropping off my son Malik Whitcher for his first year of college. I felt like my son will be taken care of as he become part of your Gonzaga community! Thank you for the wonderful welcome.